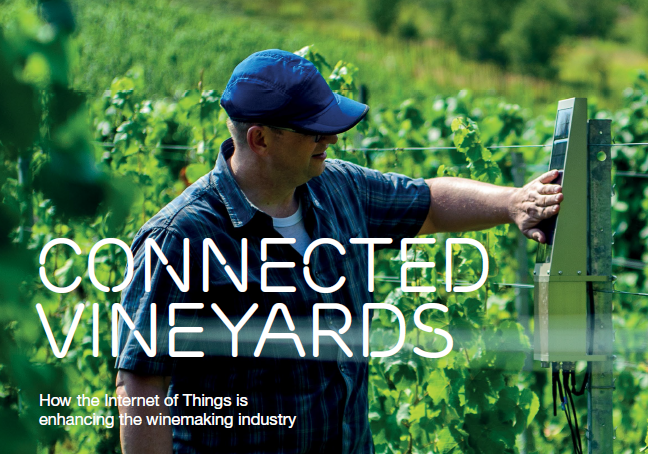 Ericsson, Intel, MyOmega System Technologies and Telenor Connexion have collaborated to build a secure Internet of Things (IoT) connectivity service that supports more effective wine production. The wine industry is one of many sectors investigating the potential of the IoT. In Germany, Telenor Connexion is taking part in a trial to demonstrate how sensor data from a vineyard environment can be collected and processed in order to better inform wine producers about their grapes. The new TracoVino service will enable winemakers to collect data on air and soil humidity and temperature, as well as solar intensity, using IoT sensors and Intel-based IoT gateways connected to a cloud service. The data can be used to perform predictive analysis and to support resource management and real-time remote monitoring, leading to higher qualityproduction, lower costs and reduced environmental impact for winemakers. The trial features Ericsson IoT Security Services, which are part of the Ericsson Device Connection Platform (DCP) providing SIM-based device authentication and secure, encrypted connectivity end-to-end. This is combined with MyOmega’s gateway and radio sensors, as well as technology from Intel and connectivity provided by Telenor Connexion, to form a complete ecosystem for collecting and analyzing data from the vineyards. The TracoVino services and solutions will be offered by MyOmega towards the winemakers. “Quality tools for the winemakers that are reducing their risks and improving the yield is our key offering. We are building with the TracoVino services and solution a first scalable IoT offering that combines sensors, IoT gateways and a secure and powerful communication solution. Thanks to Telenor’s DCP and the Ericsson Network Technology we can scale towards the entire wine market.” says Bernd Möller, CEO, MyOmega System Technologies. “We see great potential for scaling the service to winemakers globally and to additional industrial applications in the networked society, such as real estate management”, says Anders Olin, Vice President, Product Area Network Functions, Business Unit Cloud & IP, Ericsson. “Telenor Connexion and Ericsson have a long tradition of working together to set the standards for IoT. Thanks to Ericsson’s long experience in the field, we know that the solution can evolve, and if necessary, support additional revenue models and data-transfer solutions in the future.In addition, having us as the one single global provider of connectivity enables the solution to be standardized no matter where it will be sold or used.” says Mats Lundquist, CEO, Telenor Connexion. Read the press release about the TracoVino collaboration here!